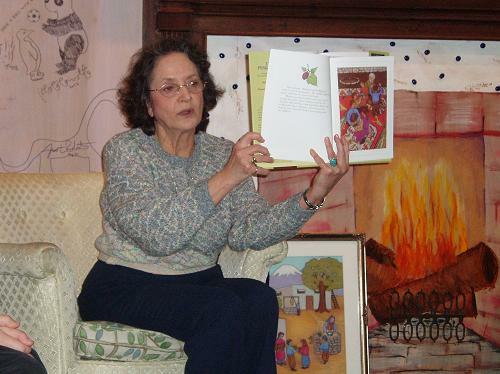 Margaret Markarian Wasielewski, illustrator of the recently published children’s book, Mariam’s Easter Parade, donated copies of her book to the Blue Ash, Maderia, and Sycamore Public libraries. Through its Learning About Other Cultures (LAOC) program, Pomegranate Publishing has donated 50 books to libraries and schools throughout the country. Through generous funding from The Wasielewski Family, the LAOC program aims to promote acceptance through cultural awareness. onto the next generation,” said publisher Marianne McCarthy. Mariam’s Easter Parade is a light-hearted story of young girl who might be too small to help with the Easter preparations, but she is clever enough to celebrate with her own special parade! Easter is a major holiday for the Armenia people. Not only do they celebrate their Christian religion, but they also mark the occasion with food, festivities, and egg-fighting contests. The book includes a recipe for traditional Armenian egg coloring and instructions for playing the egg-cracking game. Wasielewski is an award-winning artist and member of the Cincinnati Art Club and the Women’s Art Club of Cincinnati. Her work has been exhibited in New York, Detroit, Cincinnati, Florida, and Chicago. Mariam’s Easter Parade is available at Amazon.com as well as independent bookstores in the area.